First of all, please understand that we are talking strictly about pleasurecraft, the rules for commerical craft are quite different. 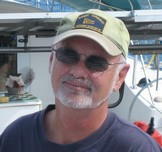 As of December 1, 2010 boat licensing is no longer be done by Services Canada. For the time being all boat licenses will be processed through an office in Fredricton, NB. Eventually certain boat dealers will qualify to issue boat licenses in house. Others may not get that privilege (Sounds like a pending conflict). There will still be no means of tracking the title of ownership of a licensed boat except for police and SAR and even that's hit and miss if the boat was licensed prior to the change to the "ON" series licenses started in 2006. Starting to sound like the Pleasure Craft Operators Card fiasco ? Get the required forms and more detail at Transport Canada Office of Boating Safety. Licenses are obtained and ownership changed through Transport Canada Office of Boating Safety and the license numbers generally stay with the boat regardless of ownership changes. When you purchase a licensed boat you should receive the license document from the previous owner or yacht broker and have it changed over to your name or make the broker earn his 10% and get him to take care of it. Licenses are simply a method of identification to be used by Police or Search & Rescure (SAR). They do not prove ownership of the vessel, only your bill of sale does that. The only legal means of identifying your boat is the HIN/MIC number, make sure it is on your license document and on your bill of sale. Both should be carried on your boat at all times. Canadian Small Vessel Regulations require that all vessels with a motor of 10hp or more must be licensed or registered and marked as such as required by the Regulation. Regarding licenses the regulation reads as follows. 13(1) No person shall operate a vessel that is licensed under this Part unless that vessel is marked with the licence number of the vessel in block characters not less than 75 mm high and in a colour that contrasts with their background. (b) on a board permanently attached to the vessel as close to the bow as practicable so that the number is clearly visible from each side of the vessel. Registration for pleasure craft is entirely voluntary. A pleasure craft may be registered by name in which case license numbers are not required. As each Registered Name must be unique, check the Ships Registry database to see if your chosen name is available and make sure your chosen name is not phonetically similar to a name already registered. You will need a tonnage measurement which you can complete yourself if the boat is 15m long or less. If your boat over 15 meters in length or a multihull of any length (with any type of cabin structure) it will need to be measured by a Transport Canada Appointed Tonnage Measurer. A registry not only provides information to police and SAR it proves ownership and a registered vessel may qualify for a marine mortgage. While hopping across the lake to the US in a licensed vessel does not pose any problems, your license may not be recognized further afield. If your vessel is registered you will receive a letter from Transport Canada every three years and you must confirm That you are still at the same address and that ownership has not changed. Should you fail to confirm that information your vessel will be suspended from the Registry. CSA 2001 ( Canada Shipping Act ) requires that if your vessel is Federally Registered by name, the full name exactly as per your Registry form "must be displayed along with your Port of Registry together on some clearly visible exterior part of the hull". "The markings may be made by the use of any means and materials which result in durable markings. All must be at least 10cm in height, made in clearly legible letters of the Latin alphabet or Arabic or Roman numerals. For more information on how to have your boat Federally Registered by name go to Transport Canada Ships Registration. 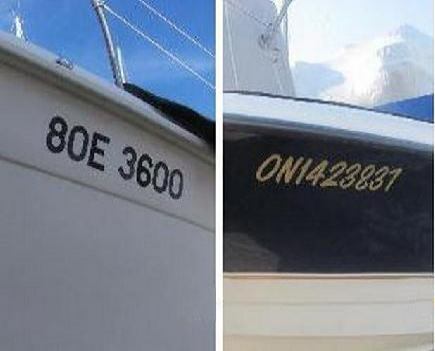 If you are buying a boat south of the border you should know that their terminology is a little different. What we call "Registered", they call "Documented" and what we call "Licensed", they call "Registered". You should also know that a Documented vessel must be de-listed by the USCG before it can be Licensed or Registered in Canada.